In 10th Class Examination, 10 marks in each Paper (subject) allotted for Bits. In Physical Science also 10 Marks allotted for Bits. In New Evaluation system CCE, New pattern Bits plays number one role. As per this CCE Method, new and indirect bits are asked in the examination. The students who understand the subject only answer these CCE Pattern Bits. So every student must Read and understand each and every concept in 10th Class Physical Science text book. 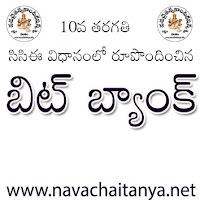 Here www.navachaitanya.net . . NavaCHAITANYA Competitions gives you some important CCE Pattern bits in 10th Class Physical Science . . . Chapter-2: Reflection of light in Telugu Medium, prepared by Sri. Chaitanya Kumar Satyavada, School Assistant in Physical science. These Physical science Practice bits are useful to all the students who are studying 10th Class in both Andhra Pradesh and Telangana States.